At a time when vampire tales enrapture teen and ’tween America, the idea of college students doing research in Transylvania sounds like the plotline for a movie spoof. Dracula 101: Advanced Seminar in Twilightology. But Notre Dame students journeyed to this rugged region of Romania with two quite serious goals in mind — to study how villagers can enjoy the benefits of 21st century life without sacrificing their traditional ways and to learn from people whose deep bond to nature and one another has changed little through the centuries. “It’s the one place in Europe where the life that existed in the 13th century can still be found,” says Krusche. The historic preservation specialist has conducted extensive studies of sacred architecture in her native India and spent the past summer with another ND group documenting the Roman Forum with a 3-D laser scanner. Of life in these Transylvania villages, she adds: “It is the roots of today’s ideal of an organic lifestyle” — sustainable farming, local food, natural building methods, a close-knit community. 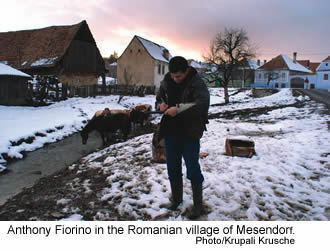 Even here, however, traditional village life is threatened as modernization advances into rural Romania. Young people are leaving the area in search of economic opportunity, and many of the area’s German-speaking residents have emigrated to Germany. Krusche’s students spent most of their time in the hamlets of Viscri, Crit and Laslea, documenting architectural styles and local customs in drawings, photos and text. They sketched home renovation plans so “modern amenities may be introduced without altering sustainable lifestyle practices,” as the group put it in a report. But this was more than an academic project. In partnership with the Technical University of Dresden, Krusche is compiling the students’ work into a pattern book that villagers can use to restore their properties and that European Union officials may consult when drafting tourism or preservation plans. She believes the students’ keen interest in the villages reassured local people that their traditions are not outdated but actually represent a valuable, living example of a green way of life. It was cows, however, that seized the imagination of almost everyone in the ND group. After grazing all day in pastures on the outskirts of the village, the cows ambled home at dusk on their own, each returning to its own barn to be milked. Who knew cows could do that? It seemed to symbolize the possibilities that modern society misses in not paying closer attention to the cycles of nature. In this part of Romania, villagers live in handsome old homes — washed in bright blue, green and ochre colors — on winding cobblestone lanes lined with pear trees. The houses are set close together, which makes the streets pleasantly walkable, but each family enjoys considerable space in the long courtyards behind their homes enclosed by walls and timber-frame barns. Beyond the barns lie vegetable gardens, orchards, walnut groves and small farm plots. Farther out are meadows and pastures used cooperatively by the villagers for grazing animals and making hay. They are carpeted with wildflowers, including some varieties said to grow nowhere else in Europe. Finally, one reaches the oak and beech woods that cover the steep hillsides, where people gather firewood and building materials. Today these villages are home to Romanians and Gypsies along with a small number of German-speaking “Saxons,” many of whose forebears were recruited here in the 13th century by the king of Hungary to help defend the borderlands of Christian Europe against the advancing forces of Mongols and Tatars. A series of unique fortified churches stand as evidence of fierce battles. Centuries later, those Saxons who once dominated the area left, many after the fall of the Berlin Wall when, unsure of their status in post-Communist Romania, they accepted the German government’s offer to emigrate. Professor Krusche first visited the Saxon villages as a graduate student in Dresden. That initial encounter was part of a project sponsored by the Prince of Wales, whose work with the local Mihai Eminescu Trust has promoted economic incentives to maintain the region’s distinctive culture. The Romanian organization had bravely opposed Communist dictator Nicolae Ceausescu’s plans to level the villages. In recent years it has funded the restoration of 300 buildings and encouraged some 1,000 Saxons to move back into the region from Germany. Other initiatives train villagers how to use traditional skills — weaving, folk dancing, tilemaking, baking and the production of jam, cheese, honey and garden vegetables — to make a better living or start new businesses ranging from bed-and-breakfasts to a commercial organic orchard. The Trust also drove a proposed Dracula-themed amusement park out of the area. The students’ work supports this kind of local economic development by offering ideas for how craft workshops, visitor centers, cafés, guesthouses or shops might thrive in existing buildings, bringing needed services and jobs to the villages while ensuring the preservation of a valuable way of life. Jay Walljasper — whose book All That We Share: A Field Guide to the Commons appears this winter — is co-editor of OnTheCommons.org and a contributing editor to National Geographic Traveler. His website is JayWalljasper.com. Originally published at magazine.nd.edu on October 05, 2010.